Set up your workspace. I usually work on top of a wooden or plastic cutting board. You don’t have to worry about the surface getting ruined with you utility knife or glues. Choose your paper! 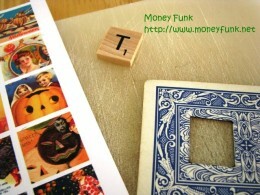 I use an old playing card as a template card. I cut a hole the size of a scrabble tile. That way when I shop for paper, I can see if the pattern will fit the tile. You can use any kind of paper; scrapbook, wrapping paper, gift cards, inchies (my favorite â€“ try Piddix for an assortment), etcâ€¦ You’ll definitely start seeing patterns in everything you touch! Holding your paper to the window, use your template card and trace the pattern for your tile on the backside. 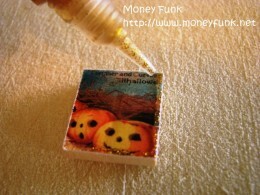 Using a square punch (really saves time) or scissors, trim the paper using around your outline (leave about 1/2″ border). 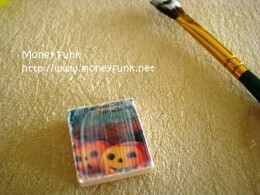 Drop a small dot of glue onto the back your paper (within your traced square). Using your finger, spread it into a thin layer (I use Tacky Glue). Place your tile in the box, being sure to notice which way is up so your letter isn’t upside down when you’re finished. In this tutorial, I actually put my tile letter under the paper cut out. If you do this, make sure to fill in the letter with some wood putty or you may end up with a letter indent in your finished product. You can do which ever you so desire. Some people like the fun of having the letter show. Your glue should be dry in about 15 minutes. With the utility knife, carefully trim around the outside of the tile being careful not to cut the tile in the process (don’t you love my daughter’s nail polish color?). Scrabble tile wood is pretty soft. Now you need to seal the paper. Use a paint brush to apply a thin layer of Mod Podge (I use Satin Finish – although I really want to try the glow-in-the-dark kind!). Let that dry for 15 minutes. I usually prop a plastic bowl over my tile while drying so that dust or particles will not (accidentally) get onto my tiles. Sometimes my edges don’t come out perfect or I don’t like the way they look. How to solve? Glitterize! I snagged my daughter’s glitter pens. Then, blotting the first spot on a napkin I worked around my tile with a thin layer of glitter glue. Don’t worry, if it comes out too thick it is real easy to clean up with a toothpick. 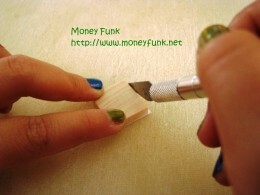 You can push the edges thinner or pick up the unwanted glue. Never seen a toothpick come in so handy! 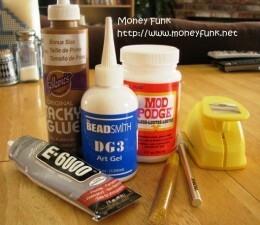 Now that the Mod Podge and Glitter is dry, it is time to apply the DG3 Art Gel . You could also use Diamond Glaze, but DG3 tends to dry more clearly (or so I have heard). Do NOT shake the glaze! If you do, you’ll end up with endless bubbles (you really don’t want that to happen). Holding the bottle at an angle, apply the glaze around the edges and then fill in the middle. Be sure to get close to the edges. The glaze won’t roll off. If you get a bubble (will happen), just touch the bubble lightly with the pad of your finger (as if to pop) and it should pull out. You can also use your nail or a toothpick to pull it out, but I find that this is harder to do. 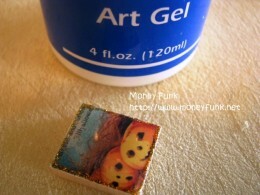 DG3 Art Gel is water soluble, so it just washes off with soap and water. Now let your tile dry for a minimum of 3 hours. 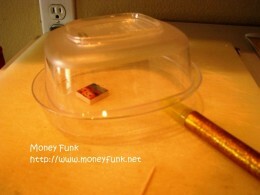 Put it back under the plastic bowl in an undisturbed place. I find on top of the microwave or in a book shelf works good. Working in a well ventilated place, it’s time to attach the Aanraku silver bail . I usually put a sheet of aluminum foil or waxed paper under this step so that the glue doesn’t stick to the surface. Hold the bail with your fingers, put a drop or two of the E6000 Adhesive glue, place tile onto the bail in the center and hold the in place. 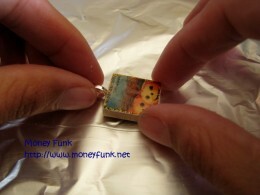 Since the adhesive glue doesn’t dry immediately, you have time to make sure you tile is properly centered on the bail. Let dry for 15 minutes. Then it’s attached and ready to go! Now its time to loop the bead chain thru your bail (you can buy this in the Lighting section of your Home Improvement store), connect and now you’re finished! Enjoy your pendant. And have fun making many, many more! This entry was posted in Tutorials on 2009-05-31 by Christine. And I love your pendants. I can’t believe the success you’ve had with your craft shows… No, I do believe because you put so much time, hard work, and have the determination to suceed. My daughter has such a great time making these, too! Great tutorial. Thanks for sharing, they really are fun to make! Thanks for the tutorial! 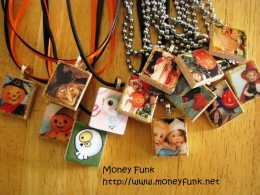 These are fun to make and will use these a givaways for my website or blog!